The other day I found a wonderful surprise in my inbox! My aunt, Barbara McCunn, had attended Quilt Canada in Halifax. 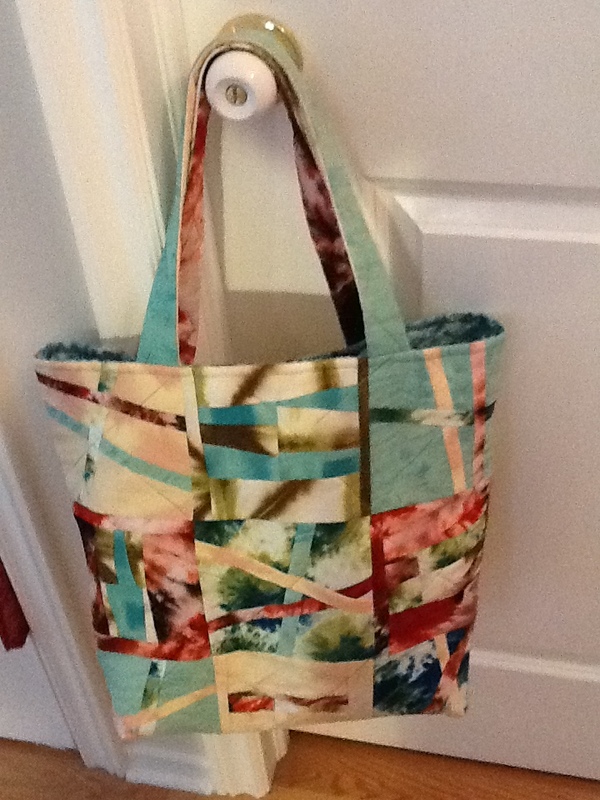 She had taken a workshop called “Take Four Fat Quarters” and sent me this photo of her completed project. Isn’t it lovely? The fat quarters she used were a Christmas gift from me last year, and were Shibori dyed. When I gave them to her I was concerned they were too disparate to ever be used together, but she has ingeniously crafted them into a cohesive whole. She’s very creative, my auntie Barb, and manages to make far more in one year than I will have time to make in my whole life. I would love to embark on some more collaborative projects with her in the future. I’m sure I’ll learn some interesting new textile techniques this year at school and maybe I can pawn some of the products off on her! I was pleased to hear that the instructor, Susan Purney Mark, was also fond of the piece, and posted it on her quilting blog. She also has a great interview on there about organizing your studio space. It has inspired me to clear off some shelf space and stack all of my fabric, and perhaps to make peninsulas out of my work tables. I also poked around and found some phenomenal photos for winning quilts at the conference. They are worth checking out, I would love to have attended. Someday when I get my quilting chops up maybe I’ll enter a submission! < Burning of the HMS Iapetus. I do indeed! However I must say that my niece was far too generous in her comments about my productivity and creativity, particularly the latter. She is on the other hand is not only very talented but also extremely creative. I am certain we will have many collaborative opportunities!! As my mom says, I’m entitled to my opinion :) I can’t wait. Love you Barb. Fabulous bag! The dyed fabrics is stunning! Great Bag! I see you have already got one. Here’s another! Congratulations! I’ve passed on the Virtual Blogger Award to you! Check my blog today to see and “pick up” the award for your blog. Pass it on if you can but if not -no worries-just enjoy your well deserved award!